Leading businesses from across Cheshire are celebrating after winning prizes at the prestigious High Sheriff’s Awards for Enterprise. High Sheriff of Cheshire, John Lea, Sam Gadsby, Director Clicky Media, Oliver Yeates CEO Clicky Media and Dr Peter Waterman OBE DL. It’s exciting to see so many innovative businesses doing so well in the county of Cheshire and being celebrated by these prestigious awards. It bodes well for the future to witness such hard work and talent as demonstrated here. The winners were announced at a special ceremony and dinner held in the Molloy Hall at the University of Chester last night (Thursday, March 29). 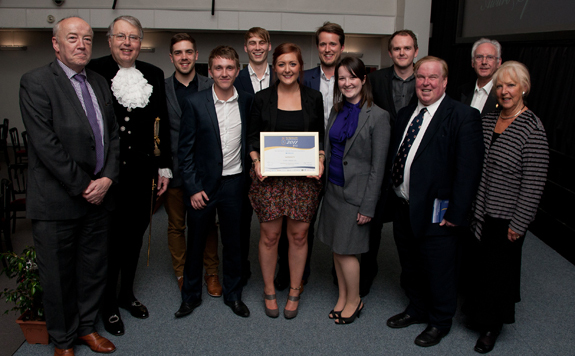 Guests included business leaders, sponsors, judges and the finalists. The guest speaker was Dr Pete Waterman OBE, DL who is the most successful British producer-songwriter in pop history, an author, DJ, Pop Idol judge, television presenter and a lifelong entrepreneur. In 2004 he was awarded an honorary doctorate by the University. Guests at the event were welcomed by the University’s Vice-Chancellor Professor Tim Wheeler and Professor Phil Harris, Executive Dean of the Faculty of Business, Enterprise and Lifelong Learning and holder of the Westminster Chair of Marketing and Public Affairs. Founded in 2006 by former High Sheriff of Cheshire and now Lord Lieutenant for Cheshire, David Briggs MBE, the Awards for Enterprise are judged on the categories of Innovation, Corporate Social Responsibility and Enterprise. The current High Sheriff of Cheshire, John Lea, introduced the awards before the results were presented by Fran Hulbert, judge and Chairman of the Business Advisory Council for the Faculty of Business, Enterprise and Lifelong Learning. 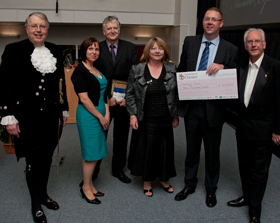 First place in the High Sheriff’s Award for Enterprise supported by Barclays, with a free place for one of its employees on the Chester Business School’s MBA valued at £10,000, was Clicky Media. Established in 2005 by Managing Director Oliver Yeates, Clicky Media, pictured right, is a team of Google-qualified internet marketing professionals with more than 25 years’ combined experience in the industry and has its head office in Chester. Oliver Yeates, Owner and CEO of Clicky Media Ltd, said: “Winning the High Sheriff Award for Enterprise is a massive honour and a great accolade for our talented team of digital marketeers! “Here at Clicky Media we love the work we do, and to be recognised in this way is a fantastic reward for our hard work, enthusiasm and creative thinking. “We were up against some fantastic competition and to be declared the winners was a very proud moment for us all. “We have experienced exponential growth in turbulent economic times, and in the past 12 months our client list has grown to include Channel 4, Olympus and Thomas Pink. MPM Products Limited, an import and export company and Evolution Recruitment of Technical and Engineering were both Highly Commended and Blueleaf, a web design and build company were commended. The winner of the Bank of America Award for Corporate Social Responsibility with a prize of £3,000 was Anthony’s Travel, pictured left. Based in Runcorn, the company covers Manchester, Merseyside, North Wales and beyond, offering all sizes of luxury vehicles, from corporate cars to mini-coaches and executive coach hire to a wide range of clients. Crewe Hall, hotel, hospitality, conference and events/leisure was highly commended in this category. 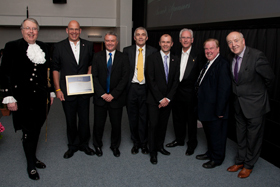 The winner of the Mornflake Oats Award for Innovation, with a prize of £3,000 was the Up and Under Group, pictured below right, based in Crewe. Established in 1987, it is a group of specialist engineering companies providing high quality services to the civil, structural, building, quarrying and industrial sectors of industry. Skytrac Solutions, suppliers of food and beverages to the travel industry and Snugbury’s Ice Cream were both highly commended. The Awards are endorsed by each High Sheriff in office and are open to businesses with an annual turnover of at least £500,000 and employ between five and 250 members of staff. The entrants are required to demonstrate outstanding performance and explain their strategy to ensure that the company will continue to expand and flourish in the future. The Awards prize fund was made possible thanks to significant contributions from the following international and regional sponsors including: Barclays Bank; Bank of America; Bolesworth Estate; Cheshire East Council; Cheshire West and Chester Council; DTM LEGAL,PKF Accountants & business advisers, Roberts Bakery, Oliver Valves; and Mornflake. Together, this sponsorship has made the High Sheriff’s Awards for Enterprise represent one of the highest values of any competition of its kind in the country.